I spent a lot of time with my Pa & Granny Holloway (paternal grandparents) as I was growing up and lived with them after my mom died, a couple of months before I turned 15, until I got married. My Granny Janice taught me how to cook & I couldn't have asked for a better southern teacher. That woman can cook and if you ever leave her house hungry, it's your own dadburned fault! One of my favorite things she taught me to cook is chicken and dumplings (we say chicken n' dumplins). I can't think of a more perfect, southern comfort food. but I never claimed to be a food photographer! 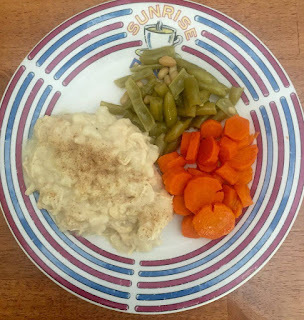 "Chicken and dumplings is one of the primary main dishes of the Appalachian kitchen, and most regional cookbooks contain recipes for it. Until the 1950s, rural families commonly killed, cleaned, and dressed their own chickens and cooked them on wood-burning stoves in cast-iron cookware. About a year ago, I posted a question on Facebook asking my friends and family if they rolled or dropped their dumplings. The majority drop, as do I. The only time that I remember having any that were rolled was at a Cracker Barrel while I was in college & in desperate need of some home cooking. I've seen some Pinterest recipes calling for canned biscuits *gasp*. I can see how that would be a bit of a time saver but it just seems so wrong! Trust me, take the extra 3 minutes and mix up a little flour, shortening and milk. Your belly will thank you. My Granny Janice has been ailing as of late (she just turned 79) and we've all been taking turns making some meals for her to warm up. I decided to make her a few plates of chicken n' dumplins, green beans & honey glazed carrots (I used some of my father in-law's sourwood honey...have mercy!). My uncle happened to be up there when I called to tell her I was on my way so I fixed an extra one for him. He told me that my chicken n' dumplins were as good as Granny's. I couldn't have asked for a better compliment. How do y'all make your dumplins? Dropped or rolled? Let me know in the comments!